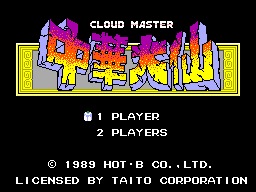 Collecting Master System Games, and any other retro games for that matter, can be a costly business at times and I've been looking for Cloud Master at the right price for a while now. For some reason the price is quite often hiked up beyond belief and as we all know a rare and/or expensive game is not always a good game, so I'd put this one off for a while and settled on an ex rental copy with sticker on the cover that knocked the price down a touch...still it's complete and in otherwise mint condition. Well enough of this collector's banter, what's it actually like? Well for anyone else thinking of buying, read on and hopefully I can help you make your descision a little snappier than I did mine. It's a shooter, people, straight up - the only difference being that it's set in the psuedo brush painted backdrop of ancient mystical china. That means instead of blasting wierd bio-critters and typical little turrets and pointy spaceships you get to ride a cloud and blitz some dragons, bowls of noodles, turtles and ancient thunder gods. 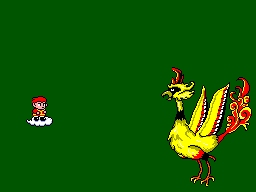 If you defeat one of the latter beasties, that come in the form of little mid-bosses that pester the arse off you, a door will open in space and time that lets you into a room where a weird woman is selling a choice of special powers, you can then use these powers to kill the end of level bosses. Nothing amazing but suitabley fitting with the whole Chinese theme, and the entire thing is filled with interesting little beasties and mythological whatsits. 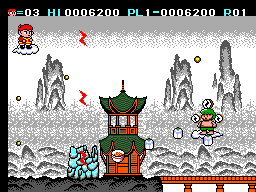 Some of the backgrounds are really nice and have that willow pattern look to them that would have been massively 'Okami' style stylised if it had been made today. All in all an interesting tone and quite unique. Happy little tunes fit the theme and all the rest of the shooty blips and beeps are in place. Decent if not mindblowing. Sharp and not too loose. You'll be zipping around on your little cumulonumbus in no time. It's mostly a bog standard shooter but it's got a sort of infectious, Parodious, style charm to it that'll keep you blasting through it's tougher parts to see all it's got cooking. In many ways it's middle of the road and in other ways it's a charming little adventure that'll be right up a good few gamers streets. However others may find little to love here and it'll just go back into the shooters section of your collection and gather dust while you're rocking R-Type, Sagaia or whatever else buzzes your nads. I, personally, kinda like it.